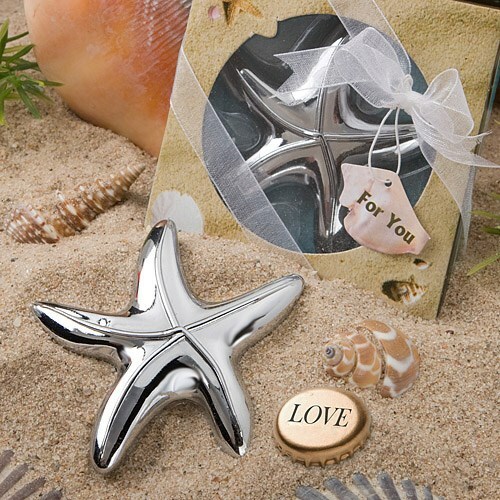 These starfish design bottle opener favours are sure to play a starring role as elegant and useful beach themed favours. Planning a destination wedding or a wedding with a beach theme? Well, whether you're going to actually be oceanside or just want to give your event some beachfront flair, these starfish favours are certainly a great catch. Each shiny silver metal chrome-finished bottle opener favour measures 3 inches x 3 inches, in the shape of a five pointed starfish with a useful bottle opener tucked in the underside. Each starfish favour comes packaged in a beach themed box with a detailed sand and shell design and a clear round window center for viewing. The box has ocean colour sides and inside and is tied with a white organza ribbon and an attached shell shaped "For You" tag.